This is titan at 4 months old,(he is 7 months now) he is so loyal and friendly, couldn't ask for a better family member! He loves to cuddle up to my 2 young children and we have recently got him a doggy friend "lexi"who is Gsd xs American alsation. 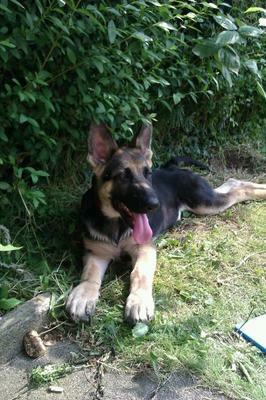 What a handsome little fellow your German Shepherd puppy Titan is! I love the picture you've sent in. And I imagine he and his new buddy Lexi really keep you busy! ; ) Nothing like a houseful of German Shepherds to make you smile. And test how good your sense of humor is. And I just remembered that you have 2 young children too. You're a brave lady, hehe! And I imagine you get lots of exercise too between the kids and the puppies. Just make sure that you teach the kids, and the pups too, respect for each other, because the puppies will quickly outgrow the kids. And as they increase in size they need to remember how to play with small children too. The time you put into them at this young age will be rewarded to you over and over as they age. Good luck with them all and enjoy this time because they're only children (and puppies) once. Get all the pictures and videos you can because in time you'll all enjoy looking back at these old memories. I wish you nothing but the best. Nothing happier than having a puppy at home!!! Titan is a handsome lil pup, and he will be big and strong by next year. Mia my beautiful Shepherd just turned 3 yrs old, I can't believe it! So enjoy this puppy time with Titan and take lots of pictures and videos, I miss it. Take care of your boy and he will always be your protector!